Add an extra sparkle to your presentation by serving in our bowl made from handcrafted polished aluminum. Part of our Beaded Collection by Belk. These were fabulous! I'm not sure why someone said there was too much liquid. Maybe they used flour instead of bread cubes. The bread soaks up the liquid. Mine turned out great! Very gourmet. Very yummy. These were fantastic! I'm not sure why someone said there was too much liquid. Maybe they used flour instead of bread cubes. The bread soaks up the liquid. Mine turned out great. Very gourmet. Very yummy. When do you add the bread and cornbread??? *editor's note: Recipe instructions updated. Preheat the oven to 350 degrees and thoroughly butter a 12 cup muffin pan. Place a skillet over medium heat, and add the bacon. Sauté until almost brown, then add the apples, onions and celery. Sauté until soft, 4-5 minutes. Add salt, pepper, garlic powder, all herbs, and stock. 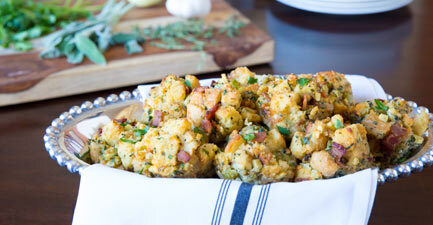 Add the white bread and cornbread cubes and stir gently to combine, then mix in the beaten eggs and shredded cheese. Use a ¾ cup scoop to portion the mixture into the muffin pan. Bake for 20-25 minutes until golden brown on top. Remove from oven and pierce the center of a muffin with a wooden skewer, toothpick, or chopstick. If it comes out clean, the muffins are done. If not, bake another few minutes and check again, repeat as necessary. Remove from oven and allow the muffins to cool for 10 minutes. Then run a butter knife around the edges of each muffin cup and lift the muffin out with the knife. Serve warm.